One of my most vivid childhood car memories was riding in a blue Corvette roadster owned by a neighbor of my grandparents. A guy down the street from where they lived owned a '67 Vette similar to this one. One day, while I was out walking with my grandfather we stopped by his house. The guy was outside talking with my grandfather and he caught me circling his car. He asked me if I wanted to ride in it. My grandfather said it was OK and the guy took me for a fast ride around the neighborhood. I'll never forget the awesome sound of it's big block engine and feeling of being knocked back in my seat by the acceleration of that car. I was probably around five or six years old and that car left a lasting impression on me. 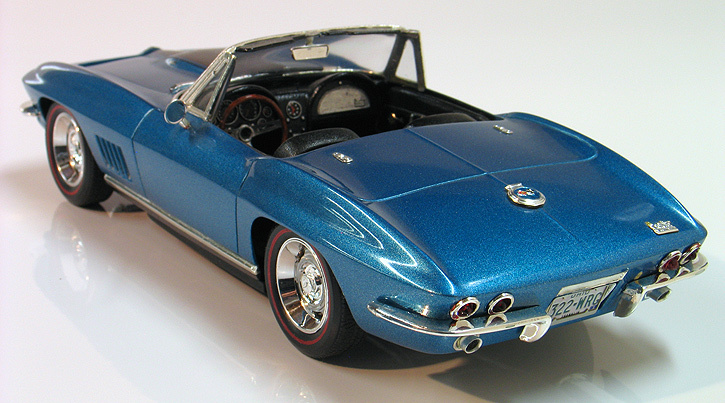 I've always thought that if I had one wish for a dream car, it would be to own a blue '67 427 Corvette roadster. I'd always wanted to build a replica of the car, but when I built this model back in 1996 it was a difficult task. 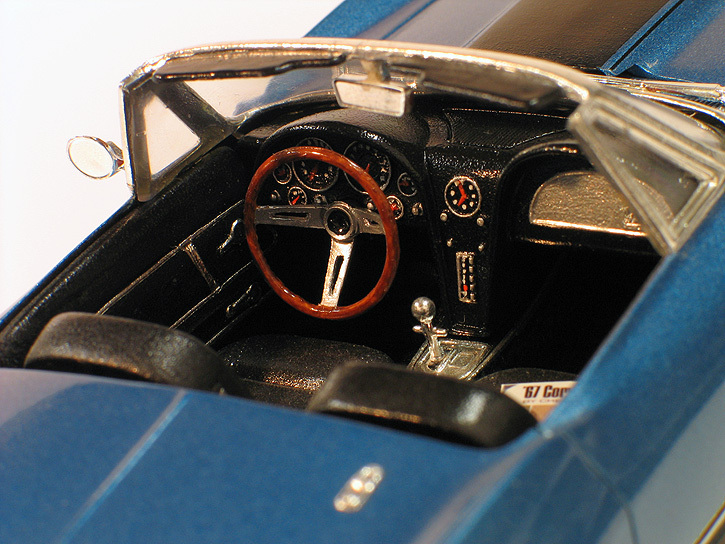 It was several years before Revell came out with their all new kit of the Corvette 427 roadster. 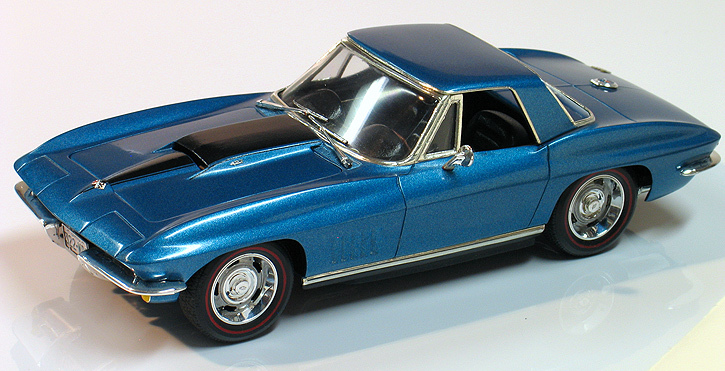 At that time the only available option was to find an original AMT 1967 Corvette kit. That kit is pretty rare with originals bringing high dollars even back then. Luckily, I stumbled across a broken original AMT body and interior at a swap meet for a pretty cheap price. Because I really liked this car so much I thought that it would be worth the effort to try and rebuild it. When I got the body, the windshield frame was completely broken off and the hood was missing. 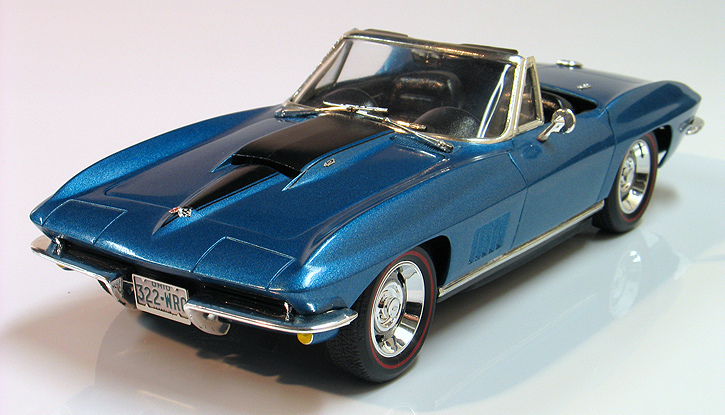 Thankfully AMT/Ertl re-issued it's '63 Corvette convertible "Prestige" kit around the same time. That kit provided much of the missing parts I needed to rebuild the model. To repair the body damage I cut out the windshield section from the '63 kit and grafted it onto the '67 body. I also had to repair some old glue damage around the bumper and taillight areas. I sourced a replacement resin big-block "Stinger" hood from the Modelhaus. It came with the scoop molded shut, so I ground out the opening and thinned the under side of the hood with a Dremel for better scale realism. 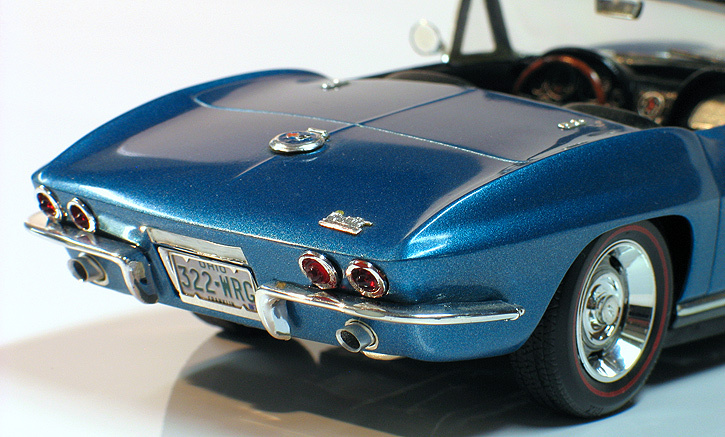 Photo etched 427 emblems came a 1/43rd scale Revell '67 Corvette kit. They were way to big for the 1/43rd scale kit but just about perfect for my 1/25th scale model. I also removed the molded-in windshield wipers from the cowl and replaced them with separate chrome parts from a Revell '65 corvette kit. While repairing the body, I also decided to upgrade the trim work by removing the molded-in parts and replacing them with separate parts. The gas cap, top locks, and all the emblems sanded off and replaced with new parts made from foil castings. This way I could paint and polish the body without fear of burying the trim in paint. I also made a set of exhaust tips from aluminum tubing. I added extra detailing to the interior by flocking the carpeting and adding seat belts with photo-etched hardware. I also photo reduced a copy of an original 1967 Corvette factory brochure and placed it on the front seat. 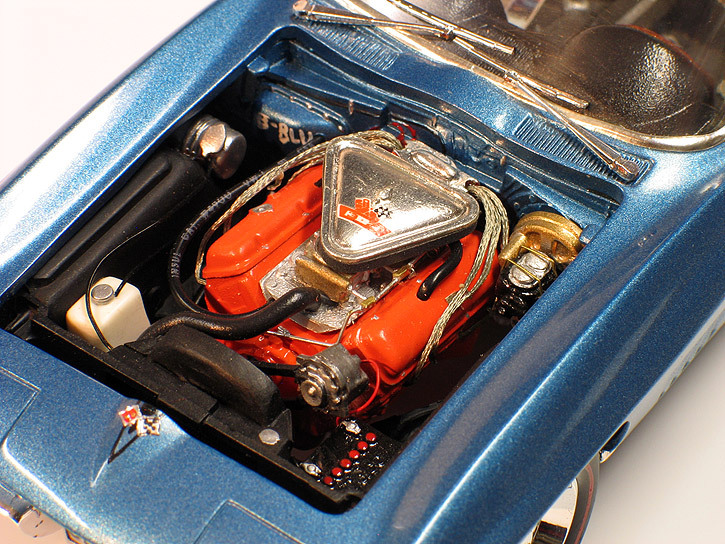 The Revell '65 Corvette kit also gave up it's nicely detailed motor for this project. Although it's technically a 396 big-block and not a 427, visually I couldn't tell the difference. The optional tri-power setup came from the AMT '63 Corvette split window coupe kit. I scratch built the hard fuel lines and added all the under hood wiring including the braided ignition wires that Vettes had to prevent radio interference. The air cleaner emblem decal came from a Fred Cady sheet. The wheels and tires came from the Revell '67 Chevelle SS kit. I used a compass with a ruling pen attachment to create the redline tires. I also added valve stems to the wheels. 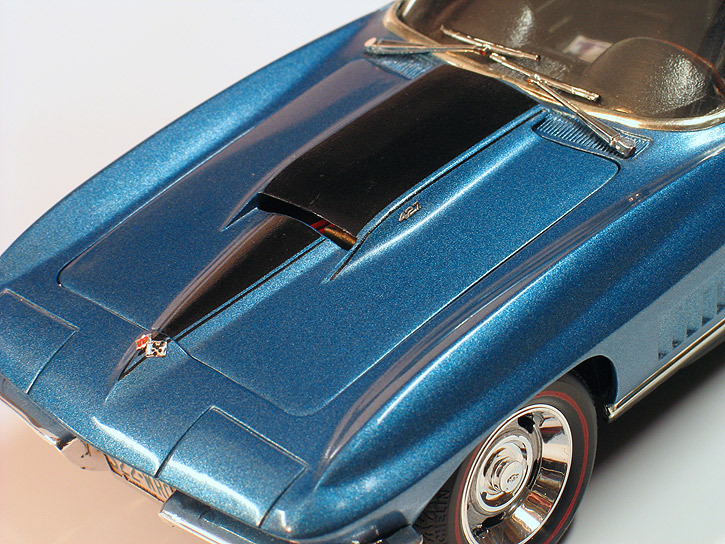 For paint I used GM lacquer in a touch up spray to match the authentic 1967 factory color called "Marina Blue Poly." It was applied over a base coat of Duplicolor primer. The paint was them hand polished using a polishing kit and the Final Detail wax. This is the old school way to paint a model by today's standards, but the paint has a very authentic sheen to the gloss which is authentic to the time period as opposed to the overly glossy look of today's base coat / clear coat look. The paint has also held up amazing well, having shot these photos some 14 years after it was built. The black factory "Stinger" hood stripe was also taken also from a Fred Cady decal sheet. 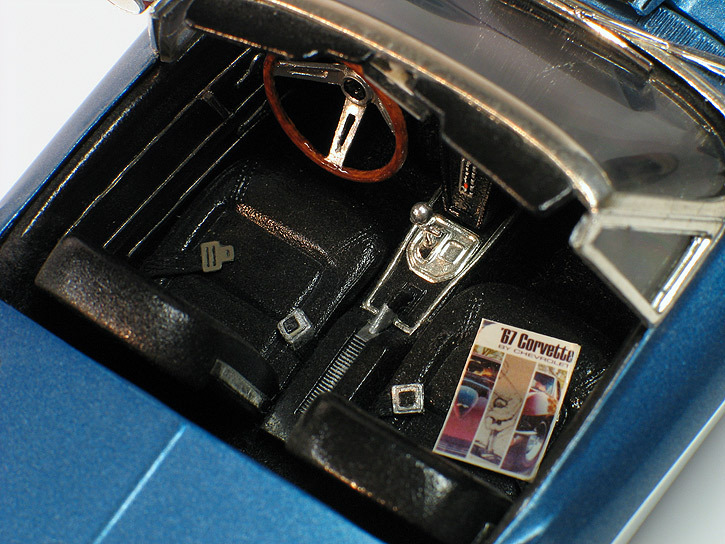 Other details include; photo reduced license plates with photo-etched frames, a side mirror from the Revell '65 Vette kit and both up tops which were found in the AMT '63 Convertible kit. This model is the pride of my collection and if I ever became a millionaire I know what my first purchase would be.